We are so excited to be a part of the Fall Fashionista Giveaway Event! Enter our giveaway for an awesome pair of BEARPAW Boots, then visits the blogs in the linky at the bottom of this post for your chances to win 100s of dollars in fashion prizes! About BEARPAW: "Tom Romeo founded the BEARPAW brand in 2001 with the intention of redefining casual footwear by utilizing sheepskin, nature’s own technical fabric, to create comfortable and stylish shoes. Sheepskin naturally regulates body temperature so feet stay cooler and drier in the heat and warmer in the cold. BEARPAW footwear is now seen as a lifestyle, one that reflects who you are and what’s important to you. It’s about sitting in front of a fireplace with friends in a winter cabin. It’s about that end of summer party at the edge of the lake. It’s about watching those last waves at your favorite beach spot before putting your board away for the winter. It’s about you and the lifestyle you lead. What we thought: I'd like you to meet the most comfortable pair of boots I've ever owned...the Siren boots from BEARPAW! These are so comfy and cozy, not to mention stylish...I mean ABSOLUTELY GORGEOUS! They look great with pretty much everything in my fall wardrobe and I know I will be wearing A LOT in this fall and winter! They are very well-made and I get compliments on them everytime I wear them out. Generally my problem with boots is how uncmfortable they are, but with the Siren boots from BEARPAW I feel like I'm wearing my house slippers all day! What more could I wish for?! 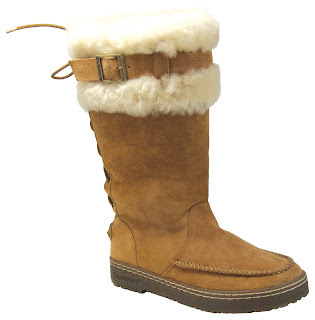 BEARPAW carries a huge variety of super stylish boots that would be great for the upcoming cooler months. They have styles for the whole family and its not too early to starting planning out those holiday wish lists:) ABCD Diaries gives BEARPAW an A+! Buy It: You can find a ton of awesome boots and more at BEARPAW! Hey, the tweet button on the rafflecopter form gives a tweet for a different giveaway (a garden kit). Just thought I'd let you know! I need a pair of boots and oh these would be comfy. I can testify to that! Bearpaw are absolutely the most comfortable boots ever. Why spend so much on Uggs boot , when you can get these. Its fur is made of sheepskin, has a thick sole to prevent against wear and tear, and goes with just everything. I remember I got a similar one called the Abigail boots from this boutique called Shoe Daca. It was for a very affordable price and cute. I recommend for many who like to buy a pair to visit their store or online website shoedaca.com. I bought mines and never regretted it. TEAM BEARPAW!